This temple is one of the 108 Divya desams. Anbil is also known by the names of Tirumaalayanturai, Mandookapuri, and Bhrahmapuri. This temple is referred to by a pasuram of Tirumazhisai Alwar where he addresses seven shrines featuring Vishnu in a reclining position - Tirukkudandai, Tiruvekaa, Tiruvallur, Tiruvarangam, Tiruppernagar, Anbil and Tirupparkadal. Thiru Anbil is one of the oldest temples built by the Kings of Chola Dynasty located on the northern banks of River Kollidam. It is believed that King Sundararaja Chozan, father of King Rajaraja Choza before entering war field, arrived in this sacred land seeking the blessings of Lord Vadivazhagiya Nambi. He returned triumphantly and re-built this temple structures in its present form. It is one of the temples built by Sundara chozha the father of raja raja chola. It seems he prayed here once before going to battle. Since he emerged victorius he built the temple in a grand manner. Once when Manduka Maharishi was in penance under water. Saint Dhurvasa waited for him on the bank for long time. Since Saint Manduka did not see the sage,Saint Dhurvasa cursed him to become frog( manduka is frog in sanskrit). Saint Mandukacame to this place and did penance on Lord Vishnu. Lord Vishnu appeared before him and blessed him,so Saint Manduka regained his form. This place was previously called as “Mandukaa (frog) puri”. The pond here is also called as “Manduka Theertham”. Once when Thirumezhisai Alwar came here, he sung a song on Lord Vishnu to appear on him and make the people know that he is Lord Vishnu’s ardent devotee, and Lord Vishnu came out of Thirumezhisai Alwar and appeared here as “Vadhivazhagiya Nambi”. 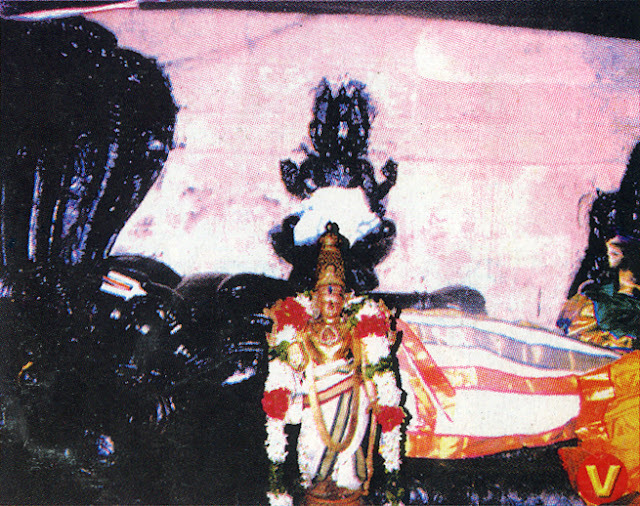 In this temple Lord Vadivazhagiya Nambi/Sri Sundararaja Perumal gives dharshan to his devotees in reclining posture with his consorts Sri Devi/Boo Devi Thayar. This is one of the sacred places where Lord Brahma and Lord Shiva worshipped Sri Vadivazhagivya Nambi and got relieved from their sins. Lord Shiva as Bikshadanehwarar arrived in this temple before leaving to Thirukandiyur. In the Tamil month of Maasi, Vadivazhagiya Nambi of Anbil goes to Srirangam and to the banks of Coloroon (river Kollidam). Morning : 07:00AM - 12:30PM ; Evening : 04:00PM - 08:00PM. From Chathiram bus stand in Trichy, one can take a bus to Lalgudi and then take another bus from Lalgudi to Anbil(about 8 kms). There is a direct bus(Route No. 93) every hour to Anbil from Chatiram bus stand. Phone: S. Varadaraja Bhattar @ 0431 6590672 / 99657 39011.